To make this easy for myself, I designed a simple daily planner with six boxes at the top. I just sit down in the morning and jot the most important things down in these six boxes. Then I make a quick to-do list at the bottom. Most days, this only takes a few minutes. Here is the Daily Planner. Print a new sheet each morning. Take a pen and write down your top priorities for the day. Sometimes, you may only have a few, and sometimes you’ll fill in all six. 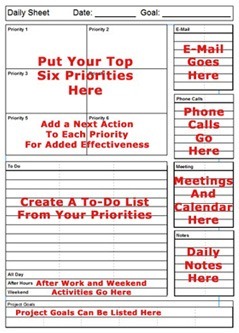 Under each priority, you may want to jot down a next-action. Once you have the necessary information filled out, create a simple to-do list. It’s real easy to do when you have your top priorities right in front of you. With the next actions listed, it’s easy to get started. 1. 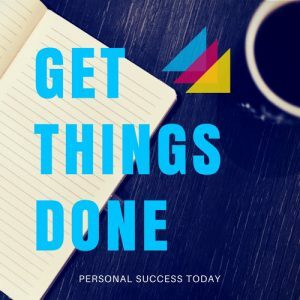 Ask yourself six things that you want/must to get done by the end of the day. Make sure they are important, not just urgent. 3. If you find it hard to get going, register an easy task first. Do it first thing. It will get your day moving and makes it easy to check off your first box. 4. Check off your priorities as you complete them, motivating you to go on. 4. List after-work activities like fitness training in the after hours box. 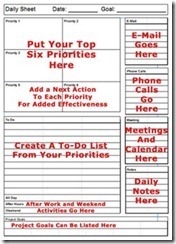 At the end of each day, store your printable daily planner sheet in a three-ring notebook. As the days go by, this will create a daily journal of your activities that you can easily compile. Question: What’s on your daily planner?